The 2016 Chevy Colorado offers cutting-edge in-vehicle technology designed for comfort, convenience, and connectivity. The 2016 Colorado offers a choice of four radio head units: two 4.2-inch models and two 8-inch models. Complete details on 2016 Colorado radio headunits. The 2016 Colorado offers Android Auto and Apple CarPlay capability. Apple CarPlay and Android Auto provide simple and smart use of smartphones in the vehicle, integrating certain phone functions onto MyLink’s color touchscreen and allowing users to call up music, navigation apps and more via compatible phones. Using either application is simple. A “Projection” icon on the MyLink screen is visible when a phone is not connected. It changes to indicate CarPlay or Android Auto when a compatible phone is connected via USB. Apple CarPlay takes the iPhone features customers want to access while driving and puts them on the vehicle’s display in a smart, simple manner. This allows drivers to make calls, send and receive messages and listen to music right from the touchscreen or by voice via Siri. 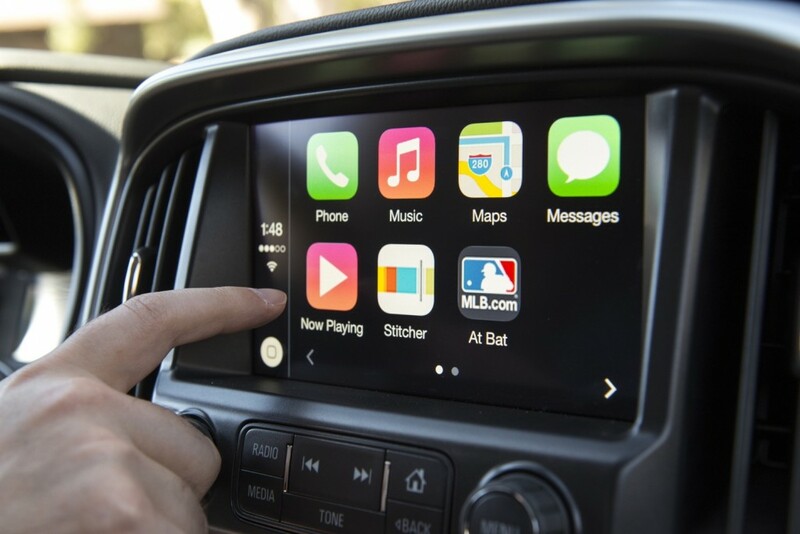 Apple CarPlay-supported apps include Phone, Messages, Maps, Music and third-party audio apps. Apple CarPlay is compatible with iOS 7.1 or higher. Android Auto is built around Google Maps, Google Now and the ability to talk to Google, as well as a growing audio and messaging app ecosystem that includes WhatsApp, Skype, Google Play Music, Spotify and podcast players. A full list of supported apps is available at g.co/androidauto. Android Auto requires a phone running Android Lollipop 5.0 operating system or above. Complementing MyLink to enhance Colorado’s connectivity is OnStar 4G LTE with Wi-Fi hotspot. It provides a mobile hub for drivers and passengers to stay connected. The hotspot supports up to seven mobile devices and is on whenever the vehicle is on. It comes with a three-month/three-gigabyte data trial, whichever comes first. It is available on WT and standard on other models. At the time of purchase, six months of an OnStar Guidance plan includes all of OnStar’s advisor-based safety and security features, including Automatic Crash Response and Stolen Vehicle Assistance, as well as turn-by-turn navigation. A rearview camera is standard on all models. A remote vehicle start system is standard on Z71 and available on LT trim level. The 2016 Chevrolet Colorado offers two sound systems: the first is a standard system and the second is an optional, up-level system from Bose. Complete details on 2016 Colorado sound systems.